While we are out in the Great South Channel looking for right whales, a group of scientists (under Dr. Mark Baumgartner) from Woods Hole Oceanographic Institute (WHOI) is collecting data about ocean characteristics using a CTD (Conductivity, Temperature, and Depth). They have established a grid of drop sites spaced 5 miles apart along a transect, with the transects 12 miles apart from each other. There are approximately 60 sites along five transects of varying length. Chart of transect lines and stations. 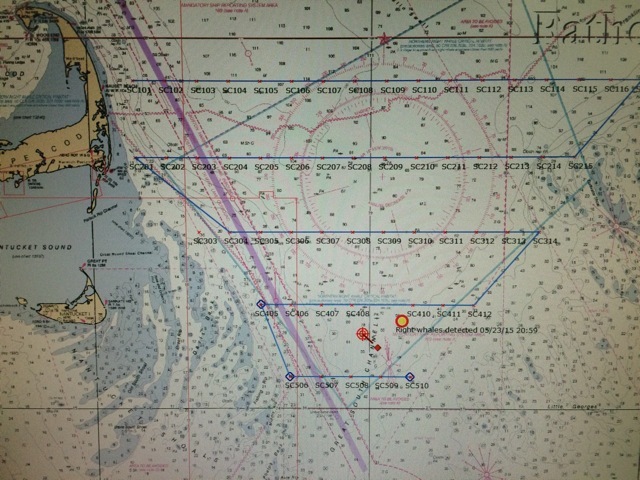 In this chart, the ship is not yet to the transect lines. What is a CTD? Well, it is a standard tool used by oceanographers to measure changes in salinity and temperature with depth. The instrument is lowered over the side of the ship with a vice winch and it is dropped through the water column at a steady rate, about 45 meters per minute, recording both conductivity and temperature. The “CTD” that is being used on this cruise includes an array of instruments and two actual CTDs that are attached to a cage. Other instruments on the cage include: two fluorometers, a video plankton recorder (VPR), and an optical plankton counter (OPC). All three of these instruments are being used to study the food source (copepods) of the North Atlantic right whale. The fluorometer is used to determine the amount of phytoplankton (food source of the copepods) in the water, which fluoresces at specific wavelengths when light is shined on them. The amount of light flashed back to the receiver is proportional to the amount of phytoplankton in the water. The VPR is actually a camera with a strobe light on one end that takes images of the water column as the CTD passes through. 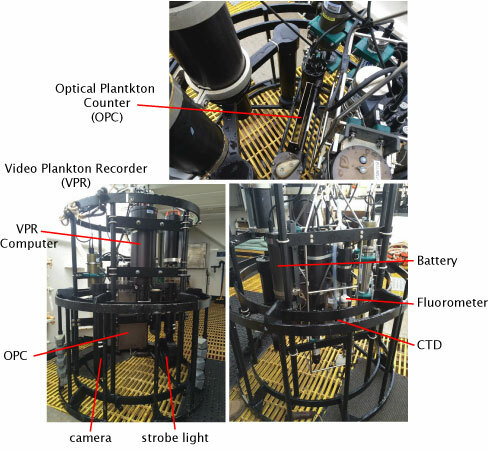 The VPR can be used to determine abundance and types of plankton, based on size, at different depths within the water column. The OPC contains a narrow, rectangular-shaped, open-ended box with a red light shining in the center. The water and plankton pass through the box and create shadows when they interfere with the light. These shadows are then counted and an abundance of plankton can be determined. The total package of instruments and weights weighs about 475 pounds. Various views of the “CTD” cage and the instruments on it. CTD coming out of the water. The orange blobs in the water are actually jellyfish. What does the CTD tell us? The CTD itself can show us how the ocean is stratified, or layered, based on different densities. These layers change seasonally and daily depending upon the wind strength and tidal strength. During the spring and summer months off Cape Cod, there tends to be a freshwater surface layer representing seasonal snowmelt that has made its way to the ocean via streams. This layer sits on top because it contains less dissolved solids and therefore has a lower density. This water also absorbs the sunlight, which makes it warm. The surface water can mix due to the wind. Phytoplankton and zooplankton are often found in the mixed layer. 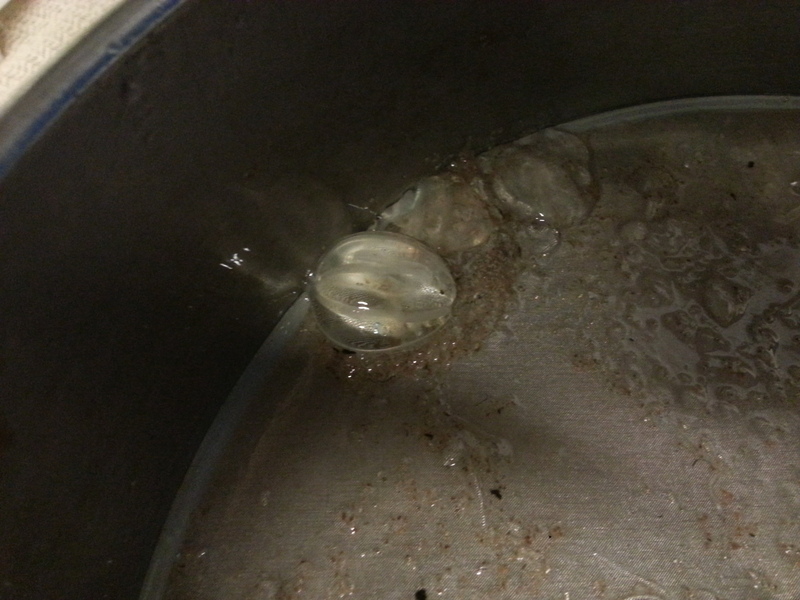 Below this zone is a relatively thick layer of cold water that does not tend to mix. This layer has been referred to as the “cold pool” and originates during the winter months. The basal layer, or bottom water, tends to be warmer, but saltier, making it denser than the cold pool. The bottom water originates out in the Atlantic Ocean proper. So to recap from the surface down: 1) freshwater, 2) mixed water, 3) cold pool, and 4) bottom water. 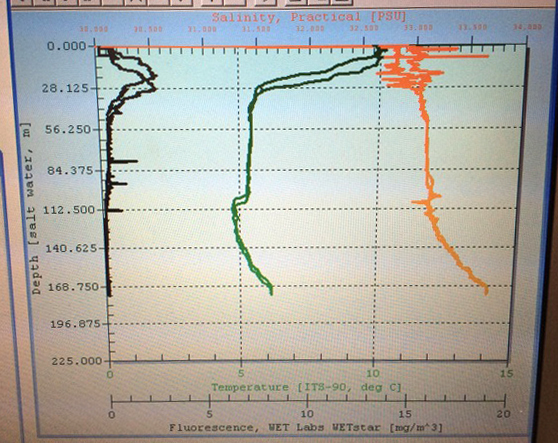 These layers can be seen on the CTD profile as temperature and salinity change with depth. Data from the fluorometer is also plotted with depth and one can determine where the phytoplankton is abundant, often in the mixed layer. CTD profile. The black line represents fluorescence, the green line is temperature, and the orange line is salinity. All values increase to the right. The duplication is due to the instrument recording measurements on the way down (the data used) and on the way up. You can see the warm, fresh layer at the top and the rapidly changing thermocline. There is also a warmer, more salty bottom water in this profile. The profile above was taken from the top track line and a eastern data site (SC115). What is a copepod? A copepod is a type of zooplankton. Actually they are minute crustaceans that contain an exoskeleton. There are thousands of species of copepods, but North Atlantic right whales are particular to Calanus finmarchicus. These copepods are kind of interesting. They feed on phytoplankton at the ocean surface during the night in hopes of avoiding being eaten themselves. During the day, they sink to the bottom waters to avoid predators. When they feed in the spring months, they store up energy in oil sacks. This allows them to hibernate at a boundary layer near the bottom during the summer months when predators are most active. Right whales are thought to dive down to this area and still feed on them. Calanus finmarchicus. Note the oil sacs (where the red color is in the copepod). Image from Centre of Ecotoxicology and Experimental Biology. 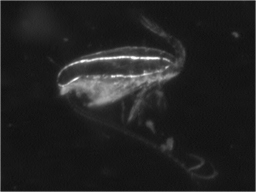 Image of Calanus finmarchicus taken in-situ by the video plankton recorder (VPR). Image from Dr. Baumgartner’s project website on Copepod Diel Vertical Migration. Several of the scientists that have been on these yearly North Atlantic right whale surveys will tell you that five or more years ago they would have seen lots of whales. On this survey, we have only seen a handful of right whales. 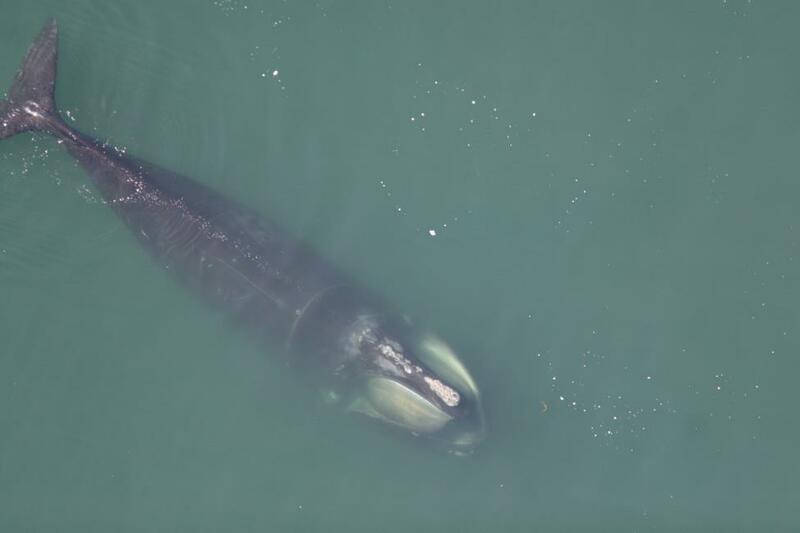 There are many questions that remain unanswered, but most importantly, where are the right whales going once they leave areas like Cape Cod Bay. They used to come to the Great South Channel, but that appears to be changing. 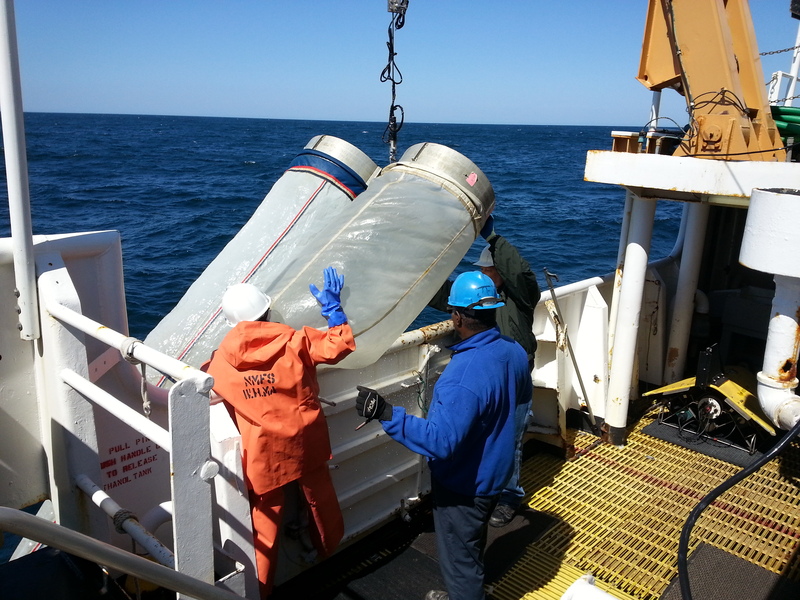 The CTD transects provide a method of studying oceanographic conditions and the location of right whale food sources on a yearly basis and provide a means of comparing ocean states from year to year. Hopefully, with further research the question of why the right whales are not coming to this feeding ground anymore can be answered. I would like to thank Dr. Mark Baumgartner for explaining much of what is written above and several students working under him (Hansen Johnson and Divya Panicker) for giving me a tour of the CTD instruments. We have been doing CTD transects for the past few days. Half the group is on a CTD watch schedule and the other half, of which I am included, is continuing the watch on the fly bridge for whales. 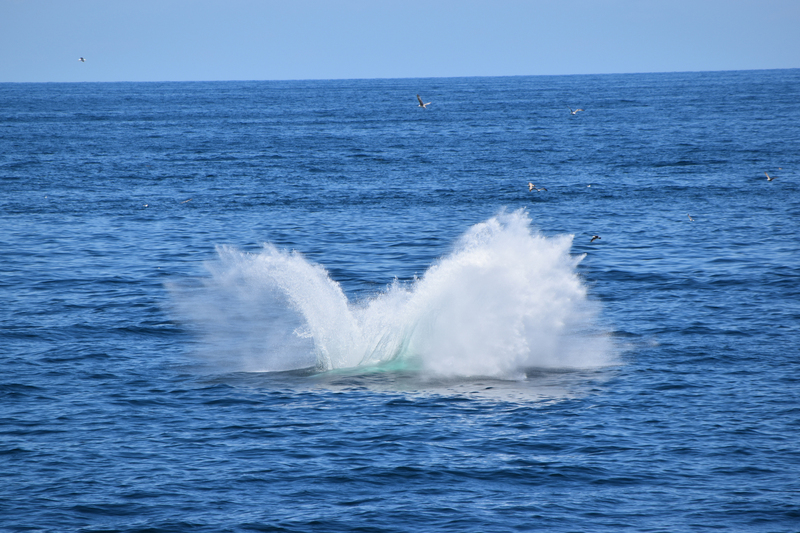 It has been slow going, due to the frequent stops for CTD drops, with not many whale sightings. Yesterday, (Tuesday) had especially low counts (only 6 observations). This is also due to the weather conditions. Strong winds blowing across the water created significant white-caps making it challenging to see blows off in the distance. 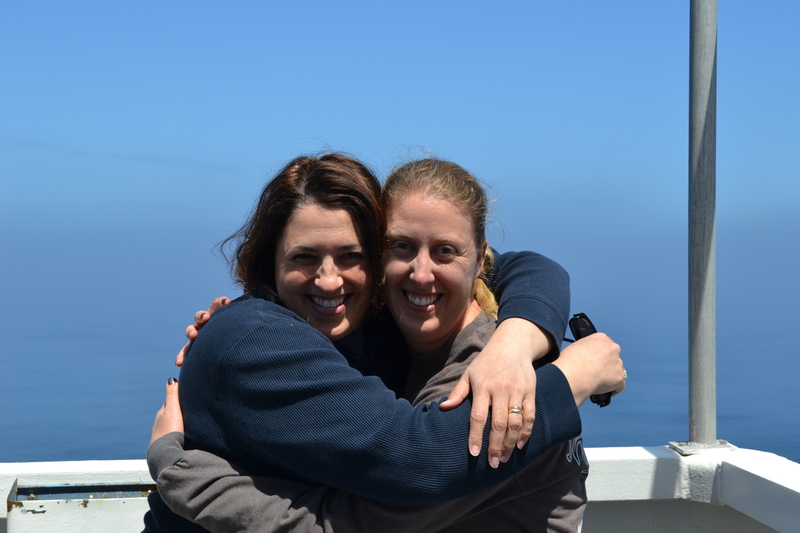 We did have a day off of sorts on Sunday when we were making our way to the first CTD transect line. The ship strangely felt like a ghost ship as everyone caught up on sleep, laundry, and movies. Since most of the watches that we are doing require sunlight, we are generally off from 7 pm to 6 am. A few of us get together and play cards, specifically the game Peanut. I had never heard of this, but am finding my life long playing of solitaire to be very helpful. Thank you Nana! Peanut is kind of like solitaire and can go by the name Nertz. Each player has his or her own deck of cards. You start with eleven cards in a pile and four single cards. The object is to decrease your eleven card pile to zero, by either stacking the cards solitaire-style on the four single cards or by placing them on the various aces (from their own or others) out in the center. The first person to end with zero wins and receives an extra ten points. Want to end with a photo of some mammals. Here is one of some white sided dolphins. White sided dolphins swimming off the boat. In the last blog post, I wrote about how right whales are photo-identified. Today we will look into what researchers do with this information and other information that are gathered on right whales including lineages of specific individuals. It really is amazing how much information has been gathered about the right whale population off the New England coast. They have been collecting data on these whales for the past 25 years. It goes to show that persistence pays off. 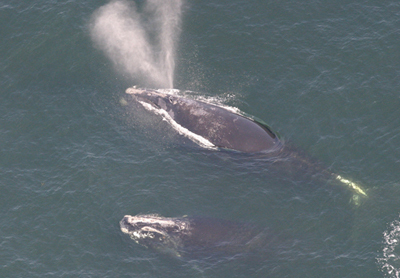 Right whales are also identified by genetics and can be used to develop right whale family trees. Scientists use a dart shot from a crossbow to collect a small sample of skin, flesh, and blubber. These are then sent to the Natural Resources DNA Profiling and Forensic Centre in Canada for DNA extraction. The data is then stored in the North Atlantic Right Whale DNA Bank at Trent University and made available as an online database. The database contains information on over 500 individuals and provides a means of studying the right whale population, keeping track of deceased individuals and paternity. DNA provides the only means of determining a calf’s father. The DNA database currently contains 105 paternity results (this link takes you to the list of father-mother-calf connections). 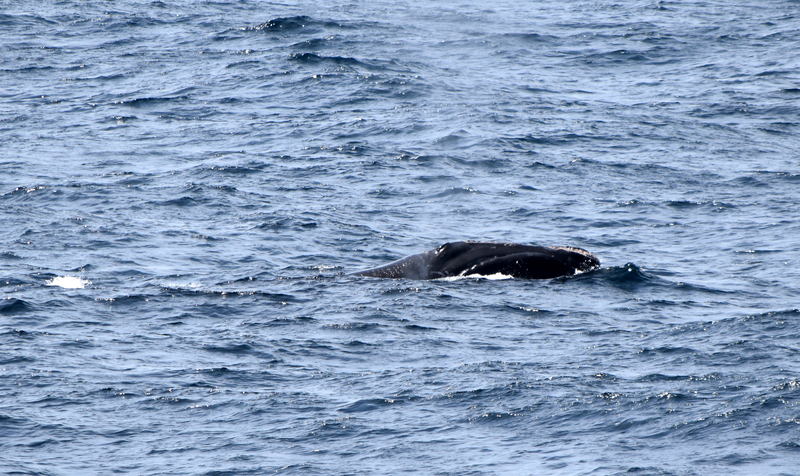 On our cruise we have been able to photo-identify a few right whales so far. You can learn more about each of these whales by looking them up in the North Atlantic Right Whale Catalog, including callosity patterns, images and sightings. Two of the whales were with calves, Wolf and 1950, and two were not, Couplet and 3890. As you can see, some whales have been named and some have not. Wolf was born in 1987 to mom, Moon, and father, 1516. She had a previous calf, Caterpillar, with Thorny in 2005. 1950 had a previous calf, Haley, in 1997 with Legs. Couplet is an interesting one and warrants further examination. 3890 is not yet in the paternity database. Females tend to breed every 3-4 years and they first give birth at age nine or ten. Image of Wolf taken by a NOAA aerial survey in 2010. 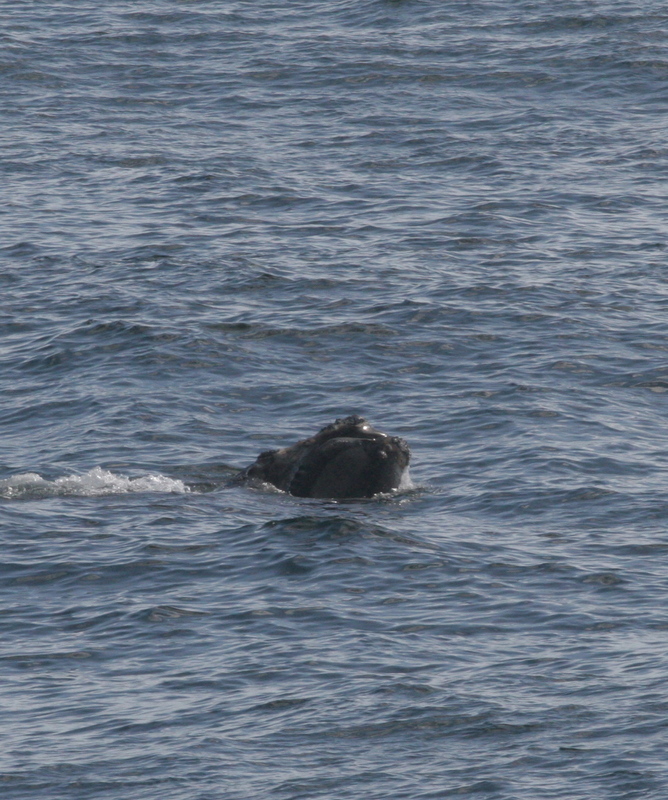 Photo from the North Atlantic Right Whale Catalog. Couplet was born in 1991 to Sonnet (mother) and Dingle (father). Couplet has two other siblings, 3123 born in 2001 and 3423 born in 2004. Couplet had a calf herself in 2003 with Velcro and another calf in 2001. Couplet’s mom, Sonnet, was born in 1981 to Kleenex (mother) and 1050 (father). Her grandmother, Kleenex, has had seven calves, with Sonnet being the second oldest. Kleenex has been well studied and is thought to be the most productive female. From Kleenex’s and Couplet’s family tree you can see that right whales interbreed. Kleenex and Dingle had a calf, Echo, in 1996, an “aunt” of Couplet’s. Couplet is a calf of Dingle as well. You can read more about Kleenex in her biography. 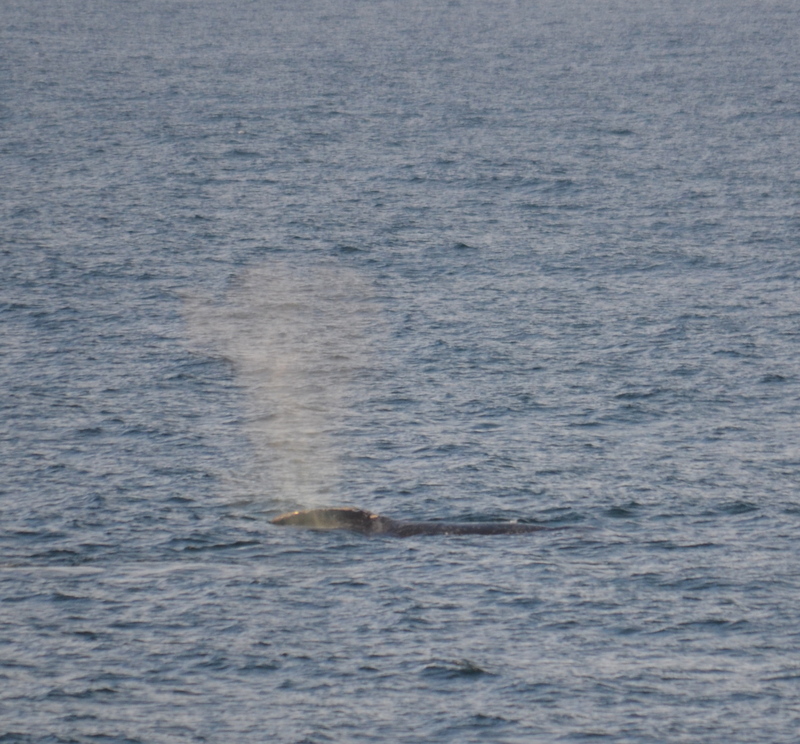 Right whale 1950 spotted on Wednesday, May 20th with a calf (the calf is not in this photo). Identified by Corey Accardo. Images collected under MMPA research permit #17355. Photo credit NOAA/NEFSC/KAD. North Atlantic right whales travel up and down the eastern seaboard ranging from Florida to Canada. Florida and the southeastern United States is the calving grounds for right whales. The calving season is from December to March. During this time there is no feeding going on. This may be due to the lack of available food. The right whales then migrate north for the summer and fall months to Cape Cod Bay (1 on the map), the Great South Channel (where we are currently, 2 on the map), the Bay of Fundy (3 on the map), and Roseway Basin/Browns Bank (4 on the map). They move between the different areas for feeding and nursing, with the population distribution based almost solely on food availability. Some individuals have been known to winter in Jordan Basin and Cashes Ledge in the central Gulf of Maine. Jordan Basin, in particular, is a suspected breeding ground for the North Atlantic right whale. Maps of the southeastern and northeastern seaboards with North Atlantic Right Whale habitats denoted. It has been a few days since I was able to write a blog partly due to weather and partly due to science activity. 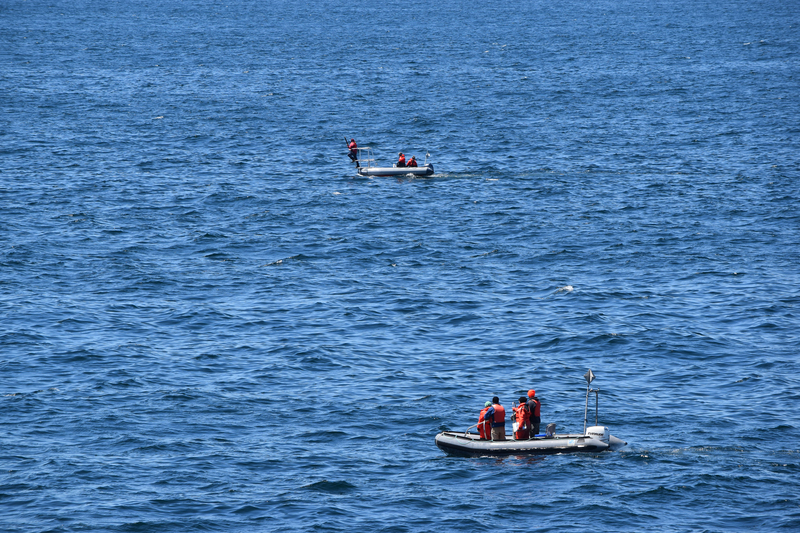 On Friday the two small boats on the ship were deployed to tag and photo-identify a right whale that was spotted around 10 am from the fly bridge. The boats are deployed via a crane that picks up the RHIBs (Rigid Hull Inflatable Boat) and puts it off the port side of the boat. The scientists then crawl down a Jacobs ladder (rope ladder with steps) to get into the small boat. While several of the scientists were out in the boat chasing the right whale, the rest of us were up on the fly bridge following the whale and directing the small boats to its location. This was especially challenging because the right whale would only surface for a very short time period and then dive down for up to 20 minutes. 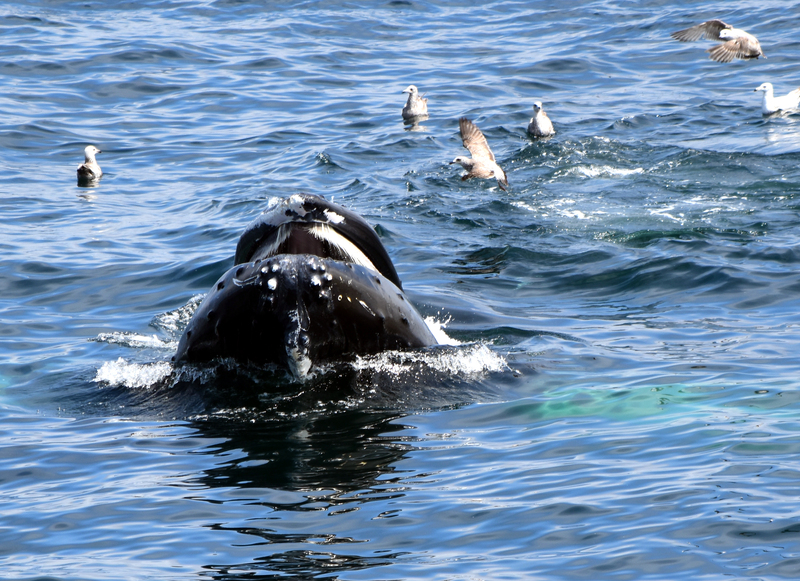 Through all of this there were hundreds of seals swimming off the bow, humpback whales feeding, and tons of birds. 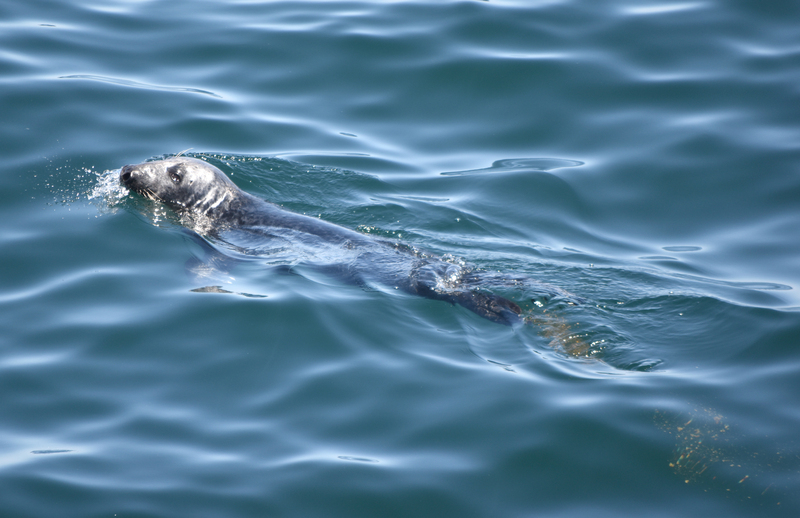 Pete, the chief scientist, also saw yellow fin tuna within the “sea” of seals. I was able to capture lots of images with my telephoto lens and with my GoPro. I will post a few below. Small boats looking for the elusive right whale. Images collected under MMPA research permit #17355. Photo credit NOAA/NEFSC/KAD. The small boat from WHOI trying to tag our elusive right whale (tale). Images collected under MMPA research permit #17355. Photo credit NOAA/NEFSC/KAD. On Saturday, we were in high seas due to sustained winds over 25 knots. The choppy sea made it very difficult to spot whales due to all of the white water. I especially was not on the Big Eyes do to the choppy seas. Mark Baumgartner from WHOI (Woods Hole Oceanographic Institute) and his team were deploying the CTD at specific points along our track line. The plan is to continue CTD work on Monday and Tuesday. I also plan to write my next blog post about the CTD. We are expected to have high seas and wind again. Humpback whale feeding. This photo was taken with a telephoto lens and then cropped. Images collected under MMPA research permit #17355. Photo credit NOAA/NEFSC/KAD. Humpback whale feeding. You can see the white baleen in her mouth. This photo was taken with a telephoto lens and then cropped. Images collected under MMPA research permit #71355. Photo credit NOAA/NEFSC/KAD. Humpback whale splash after breaching. I missed seeing (and photographing) the breach, but caught the large splash next to the ship. Images collected under MMPA research permit #17355. Photo credit NOAA/NEFSC/KAD. “Sea of seals” off the starboard side. Photo taken Friday the 21st. Images collected under MMPA research permit #17355. Photo credit NOAA/NEFSC/KAD. Almost 70 cm long pollock. That’s big! 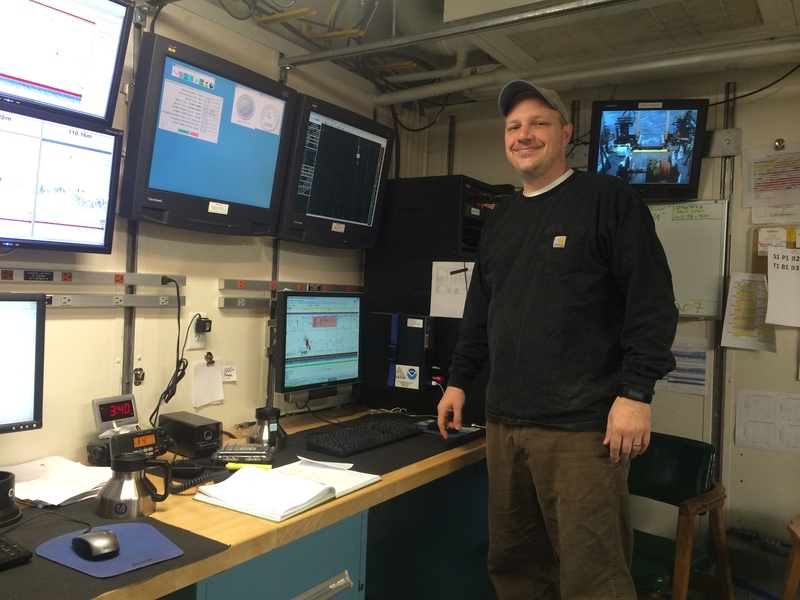 Kresimir Williams, one of the scientists on board the Oscar Dyson, has been with NOAA for over ten years. He is a Fisheries Biologist. He was born in Switzerland and moved to Yugoslavia, now Croatia, a year and half later. Kresimir has always loved fish ever since he was a little boy. He as many as ten aquariums in his house growing up. He moved to the United States when he was 17 years old. His mother is from Croatia, and his dad is from the United States. Kresimir received his bachelor’s degree from Samford University in Birmingham, Alabama with a degree in Biology and Marine Science. He received his Master’s degree from Auburn University, in Alabama with a degree in Aquaculture Fisheries. He continued his education at the University of Washington, where he earned his PhD in fisheries and aquatic sciences. He currently lives in Seattle with his wife and two children. Kresimir current interests include integrating new technologies into marine surveys. He is a fisheries biologist for NOAA and works on fishery surveys investigating new technology to make the survey process more accurate and effective. Kresimir, along with fellow scientists Rick Towler and Scott McEntire, invented the camtrawl. The camtrawl is made up of two small industrial cameras, protected by water proof, pressure resistant housing. 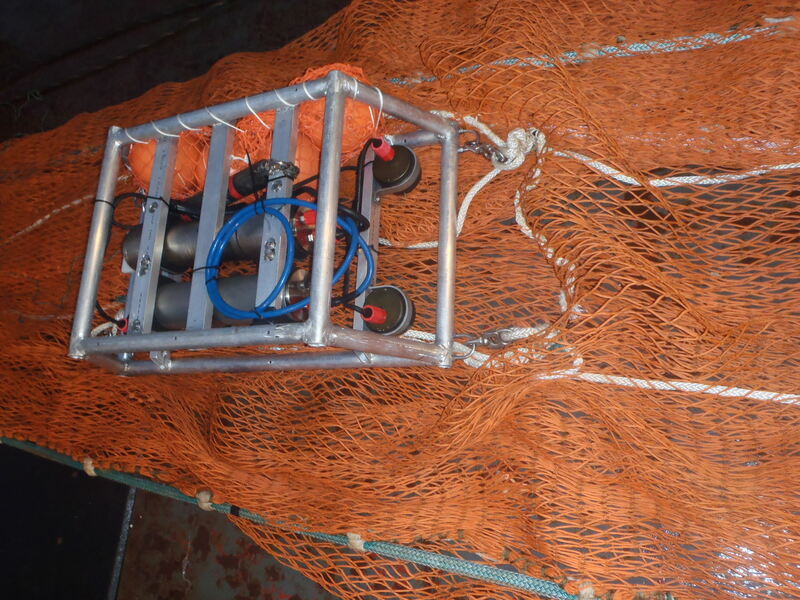 The cameras are attached to the trawl nets when deployed for fishing. The cameras continuously take pictures (about eight pictures per second) in the net. It photographs the animals as they swim through the net. 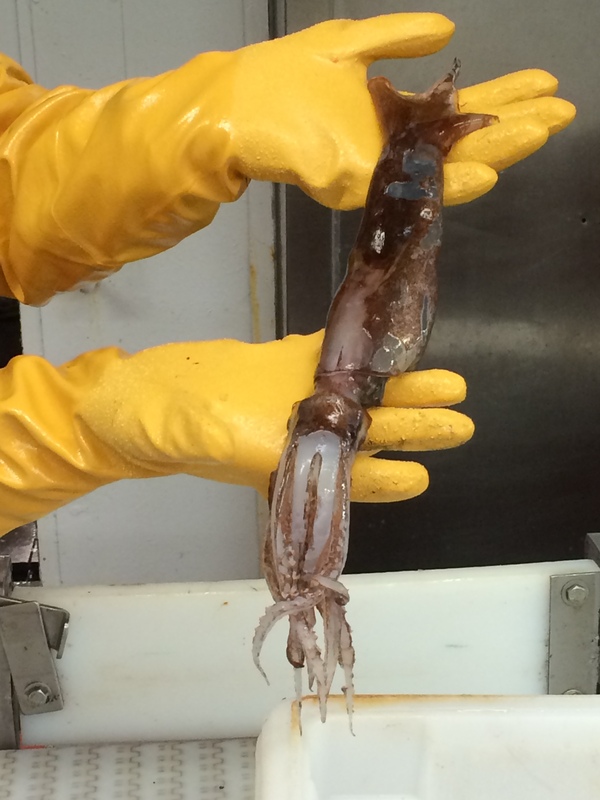 When the camtrawl is returned to the ship, the pictures can be downloaded for observation. Using two cameras in stereo, allows scientists, to accurately length the fish they observe. Looking at an object from two different perspectives allows you to see how far away an object is. If you close one eye and look at an object, it is harder to tell how far it is away, however, if you use both eyes you have better depth-perception. 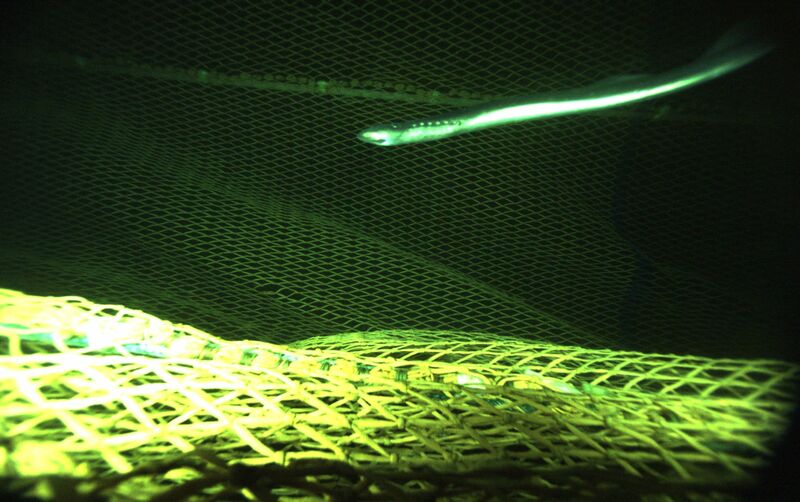 How will seeing the fish inside the net, in the ocean, help with the surveying process? The camtrawl will make the process more efficient and save time. Fewer people will be needed to conduct the surveys therefore reducing cost. 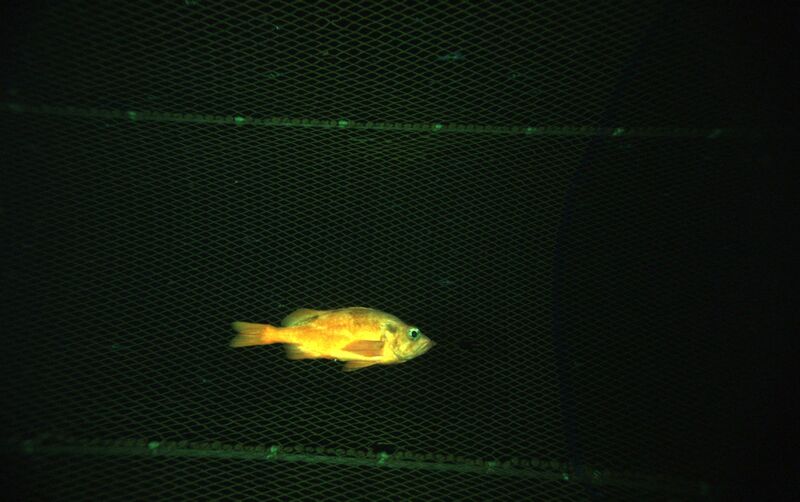 It uses a non-lethal method of sampling the fish; the codend (the end of the trawl net that collects all the fish) can be left open allowing the fish to swim through easily, so the fish will not be captured and killed. And finally, it allows scientists to sample a greater range of animals sizes. Kresimir is still experimenting with the camtrawl and testing out its’ effectiveness. He is very enthusiastic about its prospects. I really enjoy viewing the pictures and seeing the fish on the monitor. I have attached a couple of my favorite pictures for you to view. The Scientific Method is actively used in science careers and is very similar to the Engineering Design Process. It is a process that scientists follow to solve problems in order to test a theory or answer a need. In order for the camtrawl to be invented, Kresimir and Rick had to have an idea or question to get the process started. Next, the idea had to be constructed, researched, and tested (testing is the fun part) numerous times. During testing, data is collected and organized and then a conclusion can be generated based on the data. If the idea is not successful, then it is important to go back to the beginning, make changes, and experiment again. If the idea is successful, then all is good, however, there is always room for improvement. Scientists continue to test and retest until they get their expected results or prove themselves wrong and learn something totally new in the process. 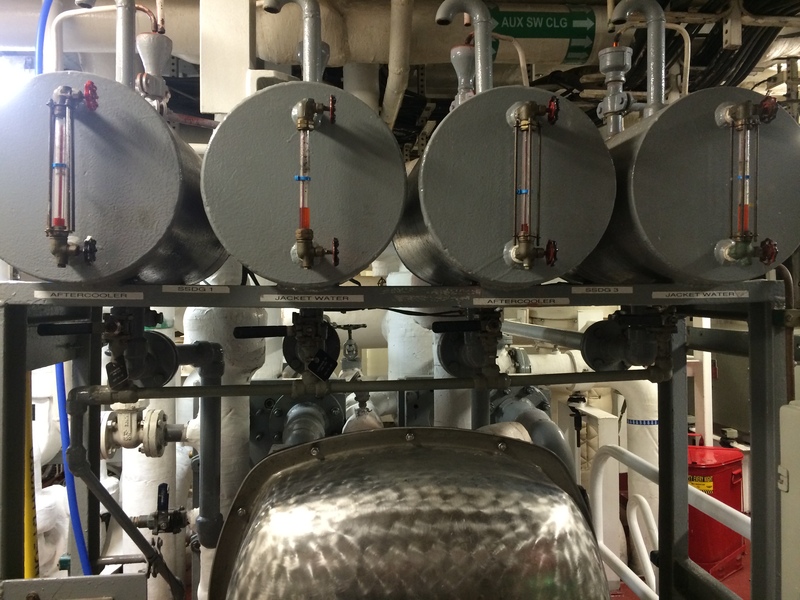 I got the chance to tour the engine rooms at the bottom of the Oscar Dyson. First Engineer, Kyle Chernoff, graciously escorted me and explained how everything works. He received his bachelors degree in Marine Engineering at California Maritime University. After graduation he had to take a series of seven coast guard exams in order to be qualified to work as a marine engineer. Besides the controls on the bridge, you can control the direction of the ship from the engine room. 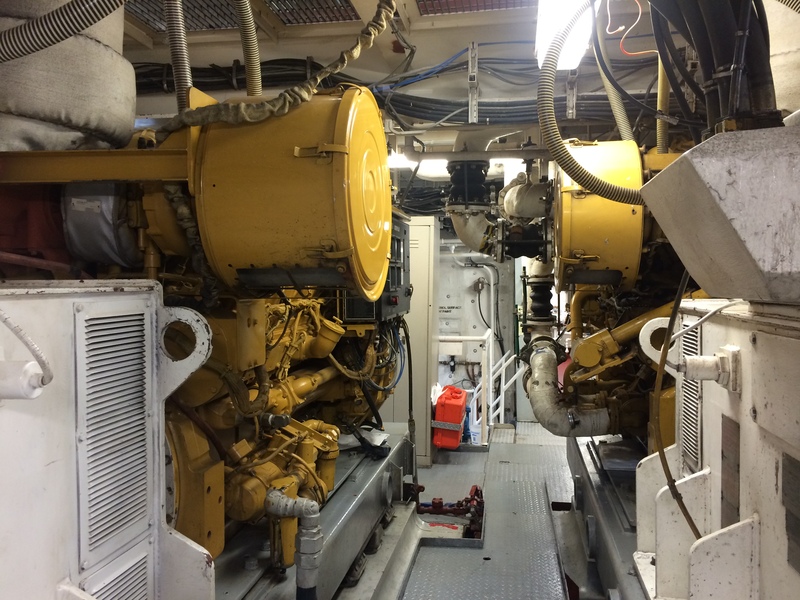 The ship has many back up motors and generators so that if one breaks down or a fire ensues, the ship can continue on its course. This is reassuring news for me and all of the 29 other crew aboard the ship. I had to wear ear plugs while walking through the generator room. It was extremely loud due to the noise the generators make to keep the ship running. One of the pieces of equipment, I found most interesting, was the evaporator. The Oscar Dyson has two. The evaporators use heat to remove the salt from the sea water and convert it into drinking water. During the process UV (ultraviolet) is used to kill any bacteria in the water to make it safe for drinking. As well as the evaporators, the ship has a special machine that removes any oil before water is released back into the ocean. This protects wildlife living in the ocean. What a great use of resources. While on the bridge this week, I saw porpoises and whales. I did not get pictures because the ship moves fast and so do the animals. I had two gorgeous days, where the sun was out and I could feel the heat on my face. Even the foggy days are nice, however ominous. It rarely rained and the seas were relatively calm. Thankfully, I did not have to don my survival suit except during weekly drills. I participated in a really cool experiment on this trip. 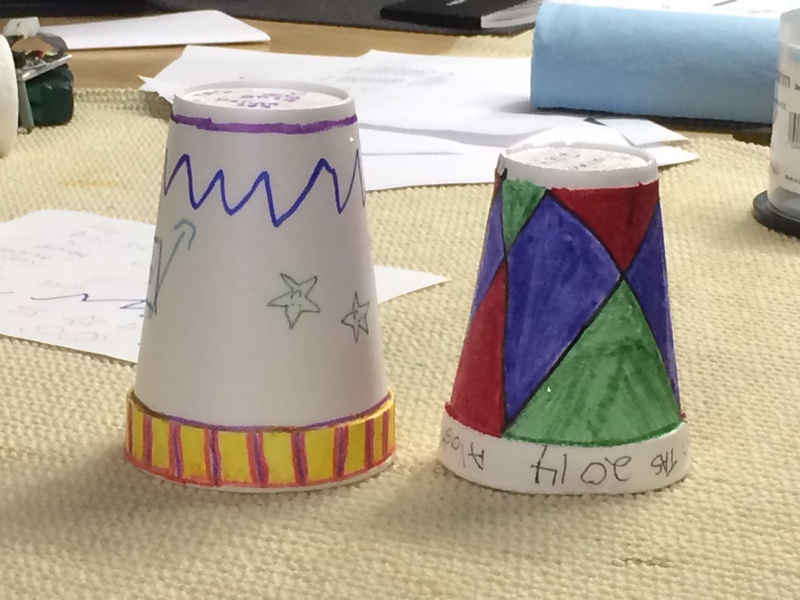 Alyssa, the survey technician, gave me two Styrofoam cups (the exact same size) and asked me to color them, in which, I did. The next morning during the scheduled CTD, Alyssa placed one of my cups into a small net bag and attached it to the CTD device. 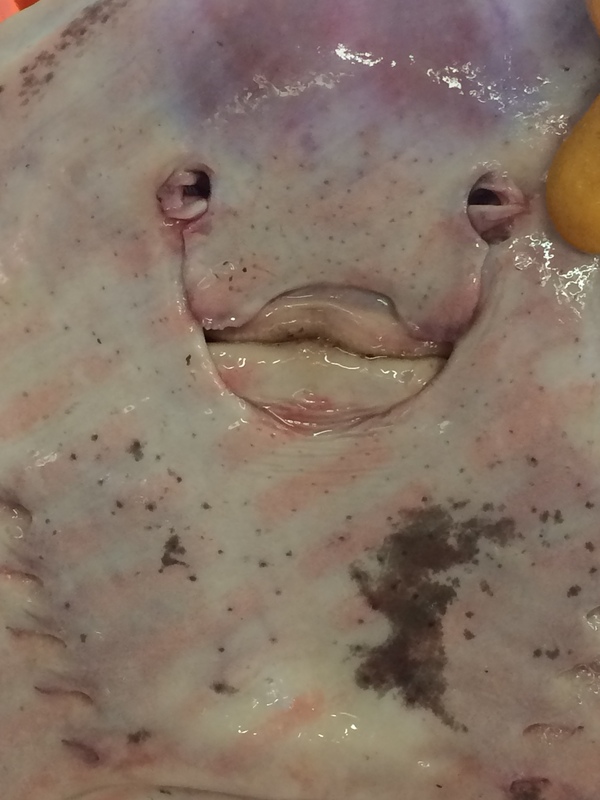 The bag was deployed to the bottom of the ocean floor. Once back on deck of the ship, she retrieved the cup and returned it to me. It looked the exact same with the exception that it shrunk. Really awesome! The air bubbles in the styrofoam cup and the pressure from the depth of the ocean cause this to happen. It would shrink even more if we were in deeper waters. 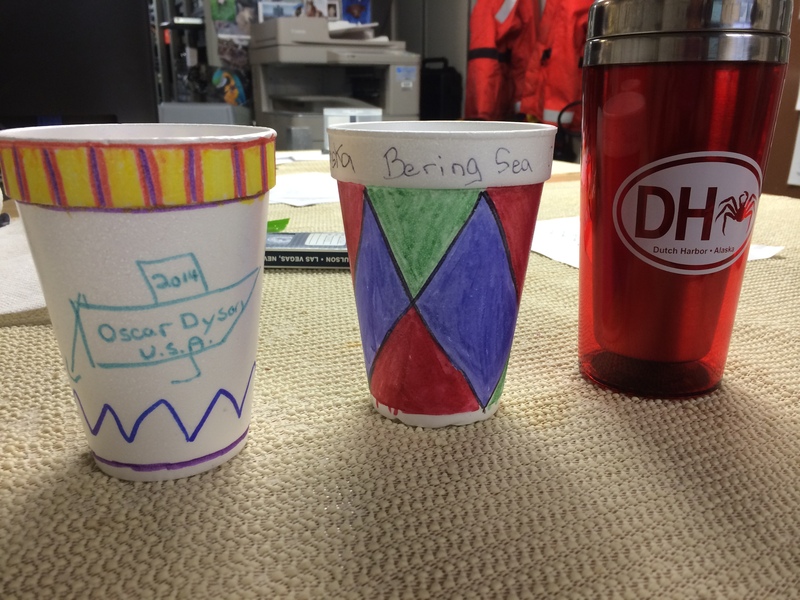 Two cups I decorated before deploying into the ocean. I only deployed the second cup into the ocean. Notice the difference in size. Over the past couple of weeks, I have learned so much. 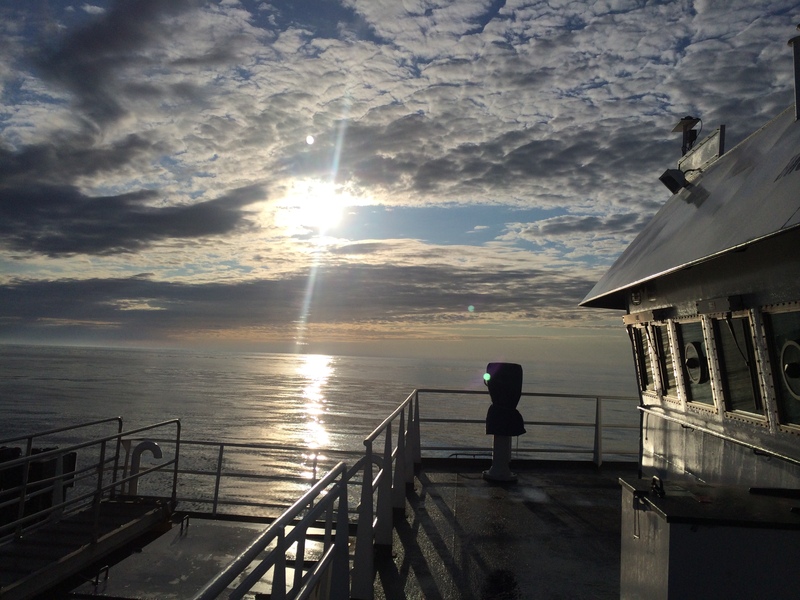 My voyage on the Bering Sea is quickly coming to an end. 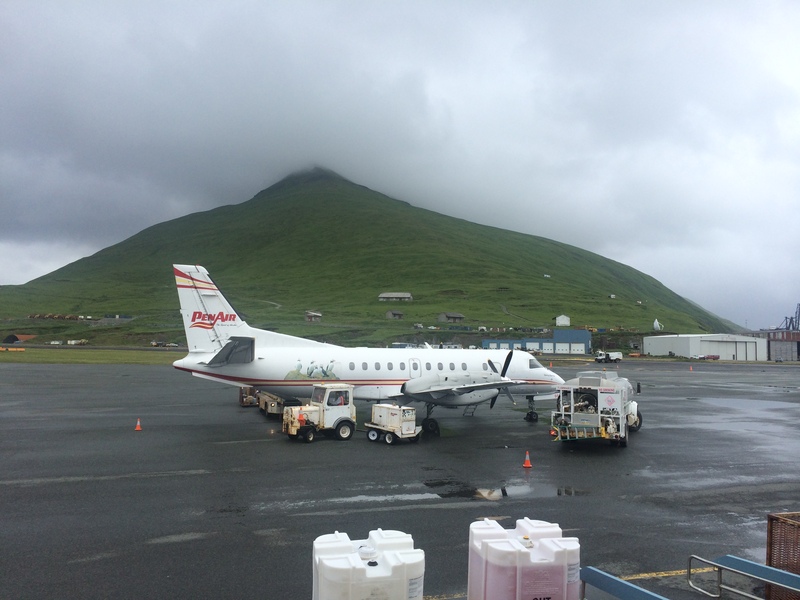 In a couple of days, I will board the small puddle jumper from Dutch Harbor to Anchorage and eventually end up in Delaware. 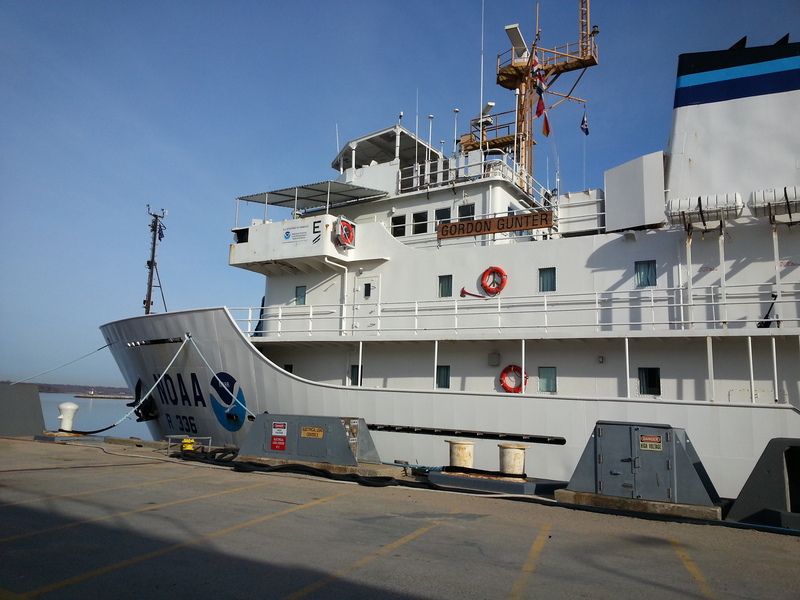 The science team, NOAA Corps, and crew have been wonderful to work with during my time at sea. This has truly been an experience of a lifetime. In my last blog, I introduced you to the Commanding Officer of the Oscar Dyson. Another vital member of the NOAA Corps and the crew of the Oscar Dyson, is the Executive Officer (XO), LT Greg Schweitzer. He is married and has four children. He has been with NOAA for seven years and was in the Air Force before that for 10 years. He received a bachelor’s degree in Meteorology and in Management. He received his Master’s Degree in Environmental Science. While not at sea, he resides with his family in Kentucky. He is second in command of the Oscar Dyson. 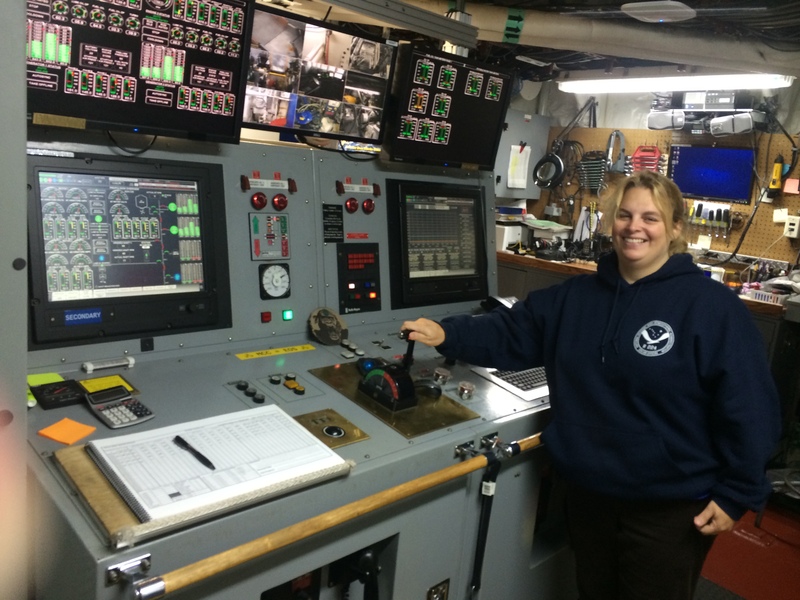 He reports directly to the Commanding Officer and oversees the officers, stewards (cooks), engineers, deck crew, survey technicians, and scientists. 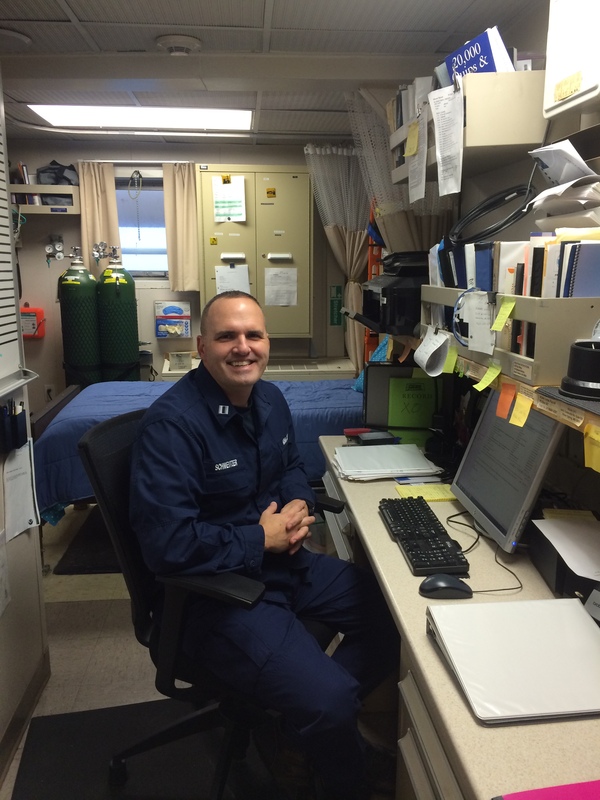 He is in charge of the ship’s budget, time cards and attendance, discipline, and port-side logistics. He started his NOAA career, after a four month officer training, then aboard the NOAA ship Henry Bigelow for 2 ½ years out of Newport, Rhode Island. Because of his past military experience, he became an XO after only six years. This is his last leg at sea before he starts a new land assignment. An experience he really enjoyed during his NOAA career, was working on his first land assignment in Fernandina Beach, Florida. He worked for NOAA’s Protected Resource Division. Part of the XO’s job was to go out, on a small boat, off the coast of Florida and Georgia, to help disentangle North Atlantic Right Whales. The XO describes the whales as curious animals that spend most of their time at the surface of the water. Because they like to hang out on the surface of the water, they easily get tangled in nets and crab pots. Right Whales are on the critically endangered list. In the past, they were hunted to almost extinction. 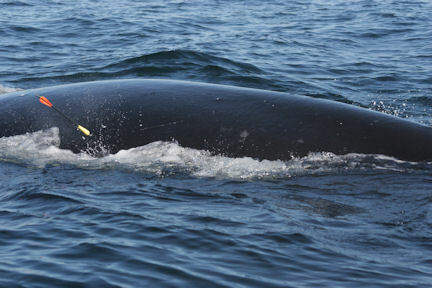 They got their name because they are easy to see and catch, so therefore fishermen, called them the Right Whales to fish. 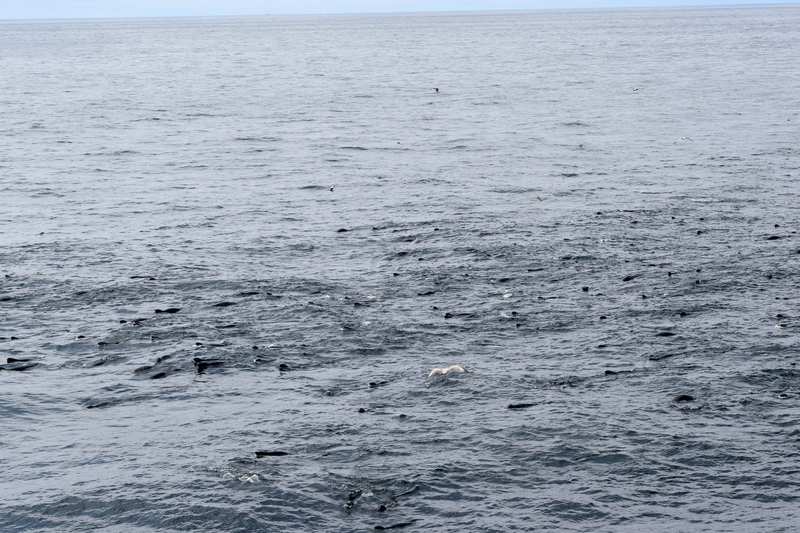 There are approximately 350 North Atlantic Right Whales living at this time. They eat mainly plankton and krill. The Right Whales are migratory animals. They are located off the Florida-Georgia coast during the winter where they calve and then travel up the east coast to Cape Code in the summertime. They swim along the Atlantic Ocean, right outside of Delaware. Check out this website for more information on the North Atlantic Right Whales. I asked the XO if he had any advice for my students. He said to remember that there is no perfect path and that students should be open to new opportunities and be willing to take on new adventures. He lived in Kentucky until he was out of high school. He never imagined he would ever leave. His Air Force and NOAA careers have given him opportunities, he might never had experienced. He also adds, that it is important to go out and contribute and remember that there is still a lot of unknown discoveries on our planet, just waiting to be explored. Job Responsibilities: Commercial fishing gear research: she looks for ways to modify the fishing gear to reduce impacts to the seafloor habitat and reduce bycatch (animals caught in net other than intended; i.e. Dolphin caught in a crab fisheries net) of commercially important species. 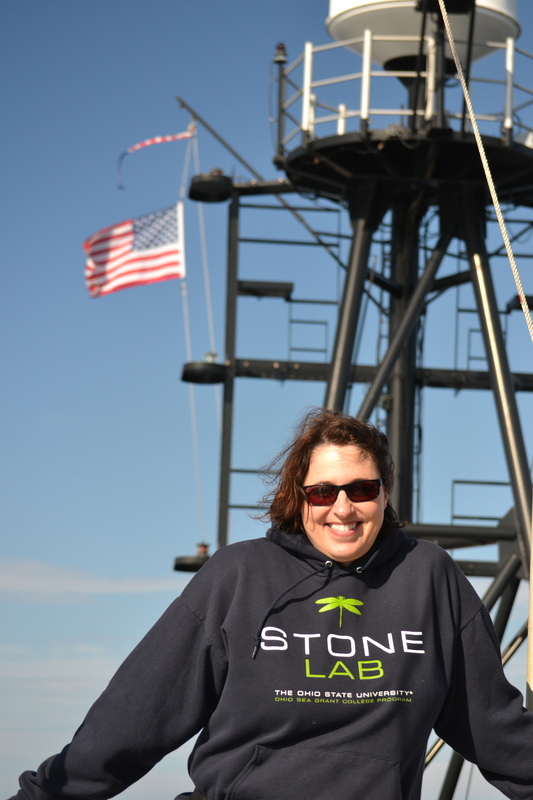 She works directly with commercial fisheries as well as helps conduct surveys for NOAA. Education: Undergraduate Degree in Marine Resource Development at the University of Rhode Island; Master’s Degree in Fisheries at the University of Washington. Hometown: She was born in Brooklyn, NY and moved to Hancock, MA at the age of six. Why pursue this career? 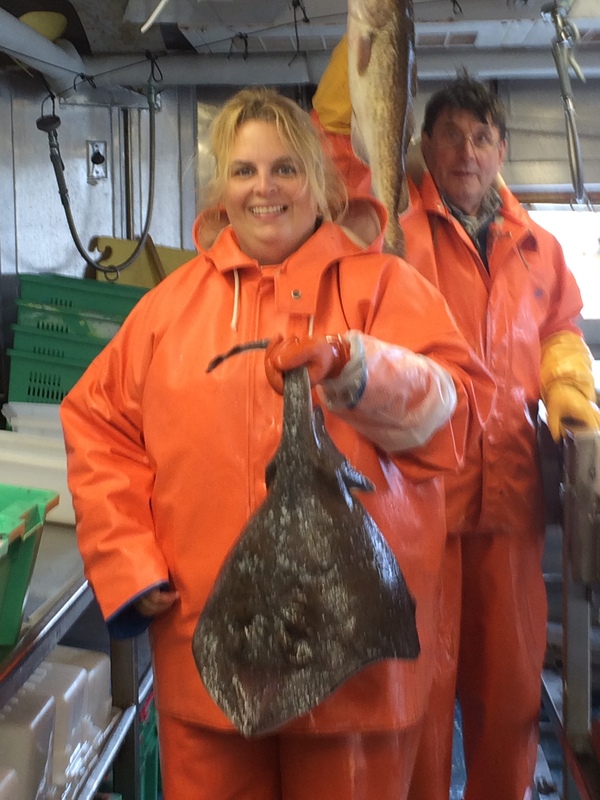 When deciding on a career, she asked, “What degree will let me play in the ocean?” and that is how she got started in the fisheries field of work. Recently, she and her co-worker, Craig Rose, won the best paper award for their work on RAMP or Reflex Assessment Mortality Predictor. Medical doctors use RAMP to check patients’ vital signs or reflexes such as tapping your knee to see if your leg reacts or kicks. They applied this method to crabs. On crabs they check six different reflexes: flare (legs moving up and down), leg retraction (pulling on leg), chela (claws), eyes, mouth, and abdomen. Checking their vital signs allows scientists to help fishermen modify their fishing gear in order to reduce the mortality rate of their catch. Good advice: I asked Carwyn, “What would you tell kids interested in pursuing a science career?”she responded, “follow your gut and never stop asking questions”. 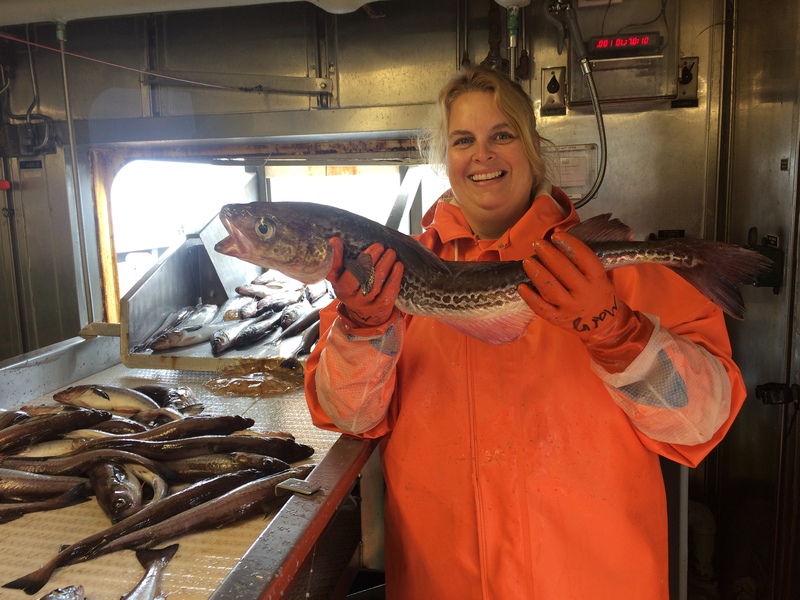 Job Responsibilities: In charge of pollock stock assessment and providing data for total allowable catch for Russia. Building a international relationship with the United States of America. He works closely with the New Fisheries Agreement between Russia, United States, Japan, Korea, and China, which works on improving fishery management for all fish. 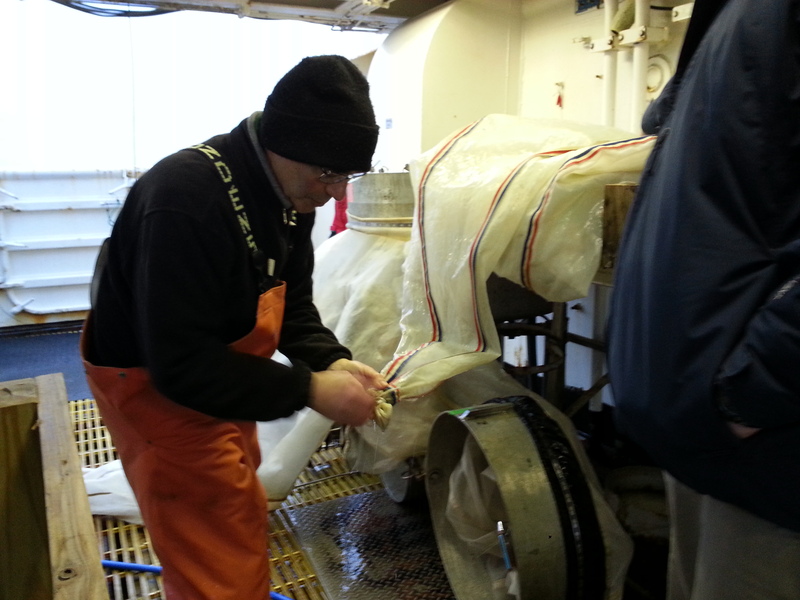 He works on both Russian and United States fishery vessels, including NOAA’s Oscar Dyson as part of the science team. Home: Vladivostok, Russia where his wife currently lives. He has two daughters and four grandchildren, all of whom reside in the United States. Why pursue this career? He has always had a dream to be a seaman and he loves sport fishing. He has an interest in animals and marine biology. 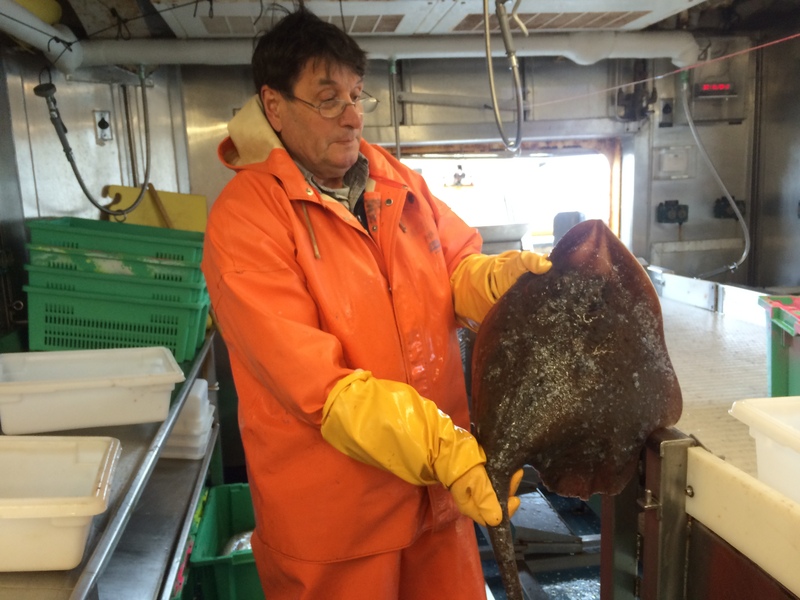 Mikhail has been working in the fisheries industry since graduating university in 1968. New Riddle from the Oscar Dyson Crew: Why does a wet deck remind you of music? Scroll to the bottom of my blog for the answer! Did you know, during a new moon (the moon is not shining) out at sea, giant schools of anchovies glow on the ocean surface? Did you know the Oscar Dyson uses 500,000 gallons of fuel a year? Answer to riddle: If you don’t C sharp, you’ll B flat. If Science at Sea is what I wanted, this is the ship for it! The evening of our departure from Newport, R.I. on Monday, April 7th, the group of scientists met in the staff lounge for a meeting of the minds. I soon found out that there was an array of scientist on the ship all with different goals and science they wanted to conduct. 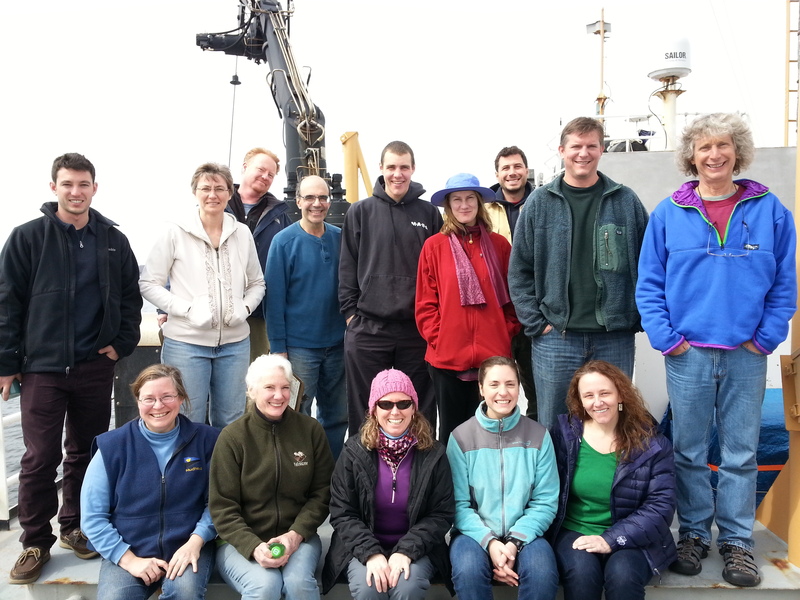 On this ship we have two teams of Oceanographers, a day team and a night team. 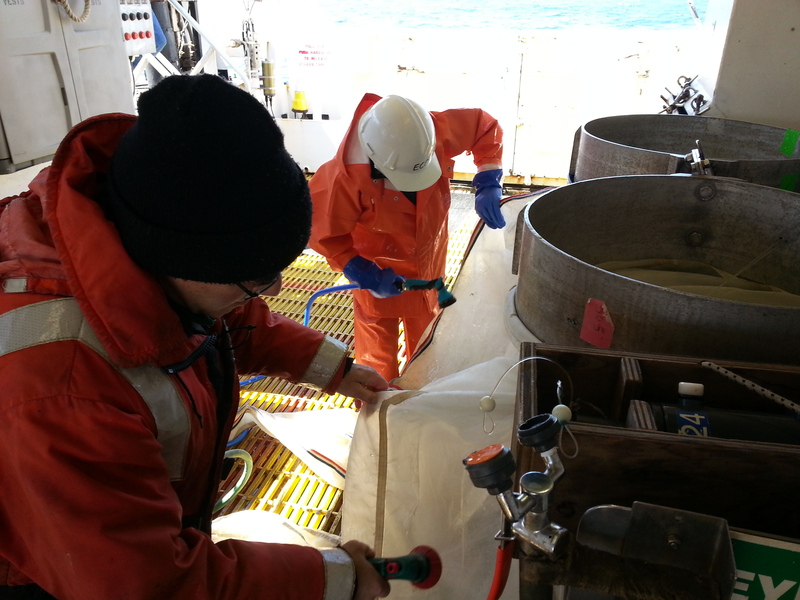 The Oceanographers are generally taking underwater tests and samples using a variety of equipment. We also have the Marine Mammal Observer Team who are on the look out for any sort of mammals that may poke head out of the water such as whales and dolphins. There is also a group of Birders collecting data on any bird sightings. And lastly we have our Acoustics, or sound team, that is listening for the sounds of marine mammals. I also learned at that meeting that it would take a lot of teamwork and collaboration on the part of each of the Scientist crews, as well as the NOAA Corps and crew to make it all happen. Every day the representatives from each team have to get together to coordinate the timing of each of the events that will happen throughout the day. The Mammal and Birding Observer teams are on the same schedule and can collect sighting data throughout the day from 7 AM to 7 PM, only stopping for lunch, as they need daylight to conduct their work. The daytime Oceanographers plan their work of collecting samples around the observer teams, sending off their collection equipment before 7AM, at lunch, and then again at 7PM when the observers teams are done. 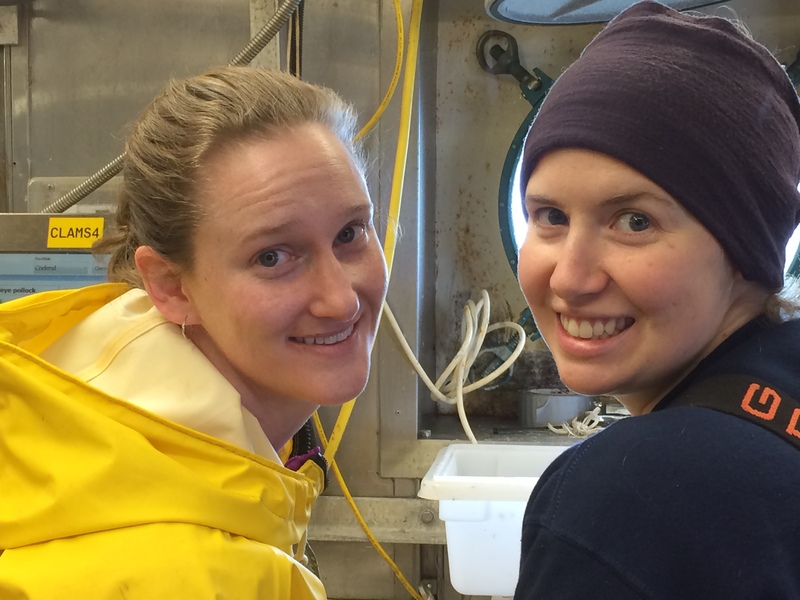 The nighttime Oceanographers are not working during the same time as other scientists so this gives them the opportunity to to do as many test and collections as they can without interrupting anyone else’s work. The Acoustic team can work anytime of day or during any kind of weather without conflicting with anyone as long as the water is deep enough to drop their equipment. It sounds like an easy schedule but there are many things, like weather, technology and location, that could disrupt this carefully orchestrated schedule of science. When that happens, and it has, everyone must be flexible and work together to make sure everyone can conduct the science they need. Scientist Jerry Prezioso tying the bottom of the Bong nets getting them really to be put in the water. Since there is so much science happening on the ship that I am doing every day, I am going to have to share just one thing at a time or I would be writing for hours! Today’s science spotlight is about scientist Jerry Prezioso and the Bongo nets. Jerry is an Oceanographer who works at the NOAA Lab in Narragansett, R.I. Jerry primarily studies plankton distribution. 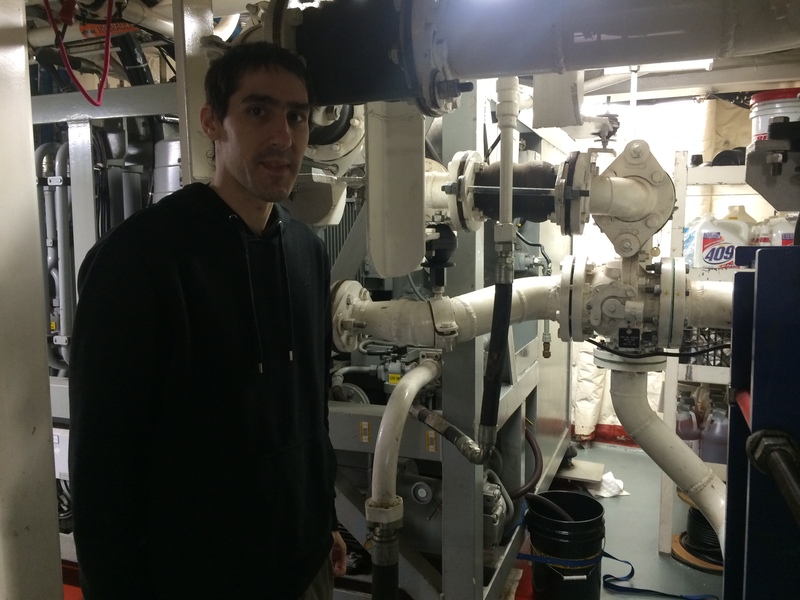 He has been on many trips on NOAA ships since he was 18! Today Jerry taught me how to do a Bongo net sample that is used to collect plankton from the various water columns. At the top of the net there is a piece of equipment called a CTD (Conductivity Temperature & Depth Unit) that communicates with the computers in the lab on the ship. The scientists in the lab use that piece of equipment to detect how far down the net is going and when it is close to the bottom, as well as collect data on the water temperature and salinity. Once the CTD is set and turned on, the Bongo net can be lowered into the water. The nets have weights on them to sink them close to the bottom. Once the nets are close a scientist at the computer has the cable operator pull the nets up and out of the water. Once they are on deck they have to be washed down so all the organisms that were caught in the netting go to the cod end of the nets. The cod ends of the nets are opened up and the organisms are rinsed into a sieve where they will carefully be transferred into glass bottles, treated with formaldehyde and sent to a lab for sorting. There were lots of organisms that were caught in the net. Some that we saw today were: Copepods, Comb Jellies or Ctenophora, Herring Larva, aquatic Arrow Worms or Chaetognaths and tons of Phytoplankton and Zooplankton. 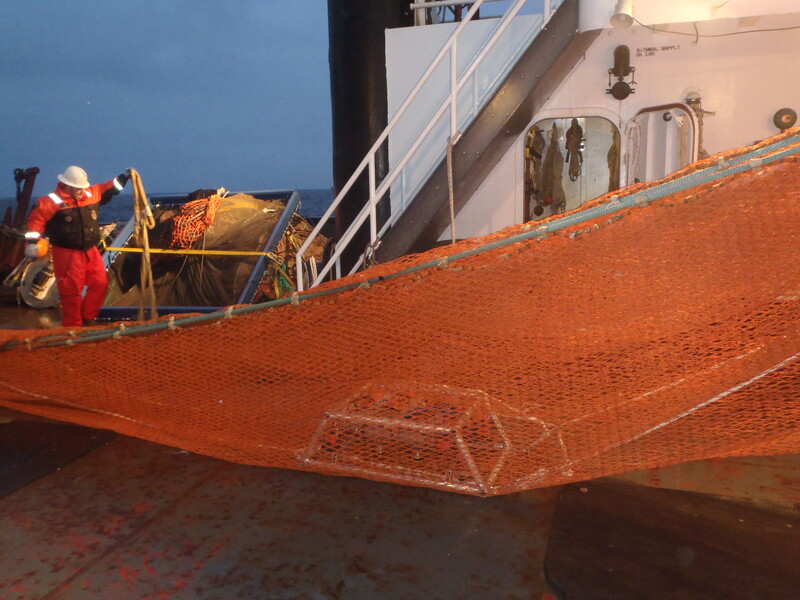 The Bongo nets are towed several times a day and night to collect samples of plankton. Jerry Prezioso and I washing down the Bongo Nets. – Photo by Chris Tremblay. 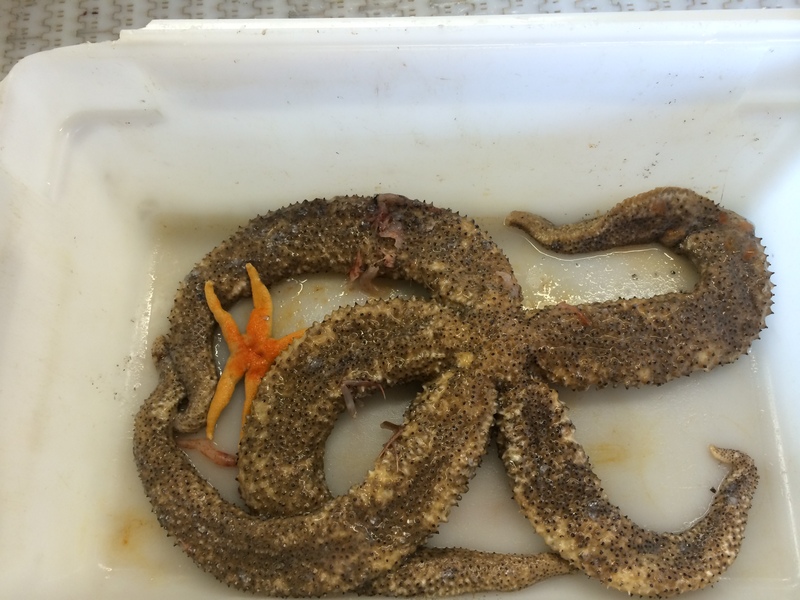 A shot of some of the creatures we caught being filtered into sampling jars for processing. The start to the trip has been a little rough. It feels like this is the first day we have been able to do anything. Monday we had to sit in port and wait for a scientist to calibrate some equipment before we left so we didn’t get underway until bed time. When we awoke, the weather was bad and the seas were very rough. Several people were very sick and some still are. 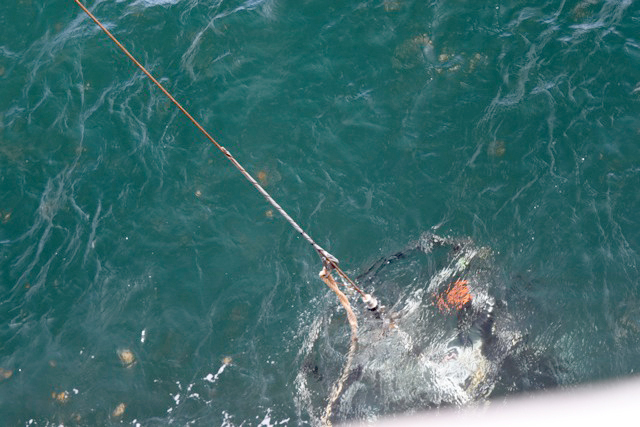 We were only able to drop one piece of acoustic equipment all day (more on that in another blog). We also had to change the plans on where we were going and move closer to shore due to the weather. On a ship you need to be very flexible as things are changing all the time! Today was the the first day we were able to do any real science for a sustained amount of time and there were definitely lots of bugs and kinks that needed to be worked out. On top of dropping the BONGO nets with Jerry, I was also able to spend some time and fill in some shifts on the the decks with the Marine Mammal team watching for whales and dolphins. 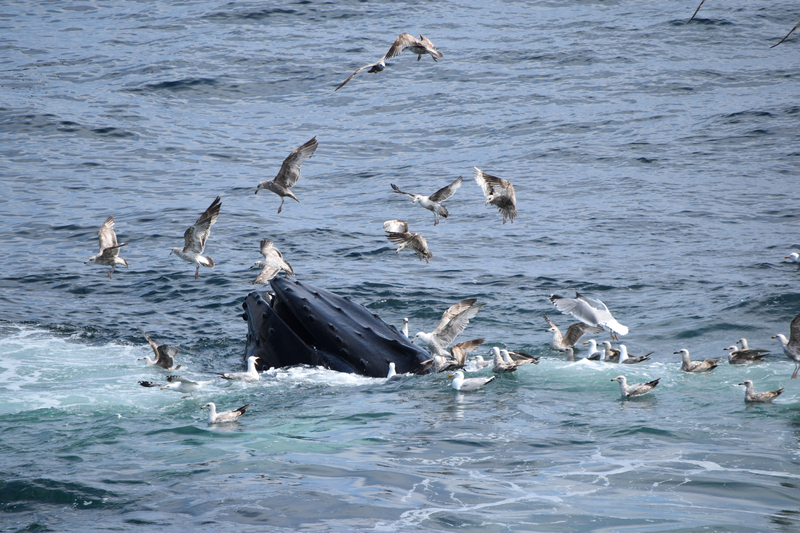 We had a few cool sighting of Humpbacks, Minke, and a Right Whales! (More on them and what they do in another blog too.) On another note, the state rooms are huge and I am sharing a room with one of the acoustic scientists, Genevieve. She is very nice and helpful. The food on the ship is spectacular! I am very surprised how good it is and how many choices there are every meal. All and all things are off to a good start and there is so much more I have to share with everyone about what all these scientist do and it is only our first “real” day! Did you know that North Atlantic Right Whales have a V- shaped blow. Their blow holes (two) are separated which gives them the characteristic blow shape. 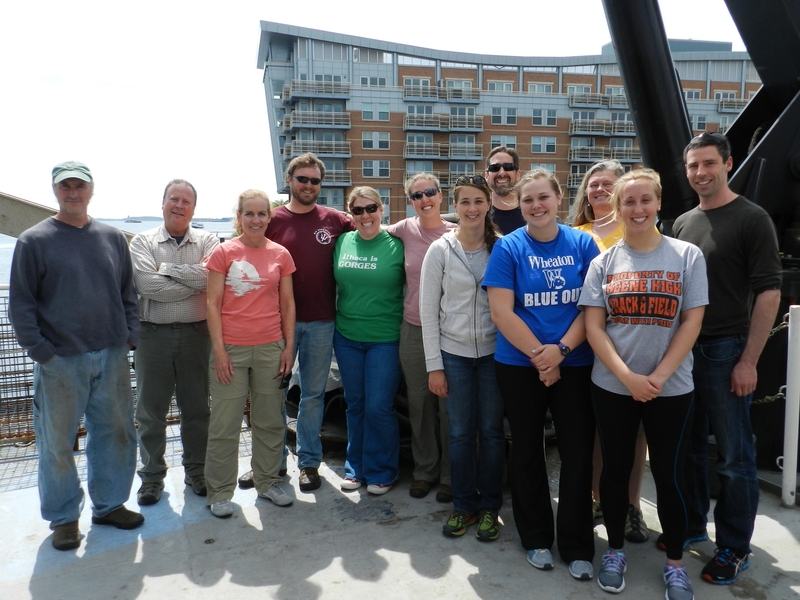 Check out this link to the website at Northeast Fisheries Science Center’s Protected Species Branch (NEFSC PSB) Right Whale Team and the work we do there. There is an interactive Google map site and wonderful links. 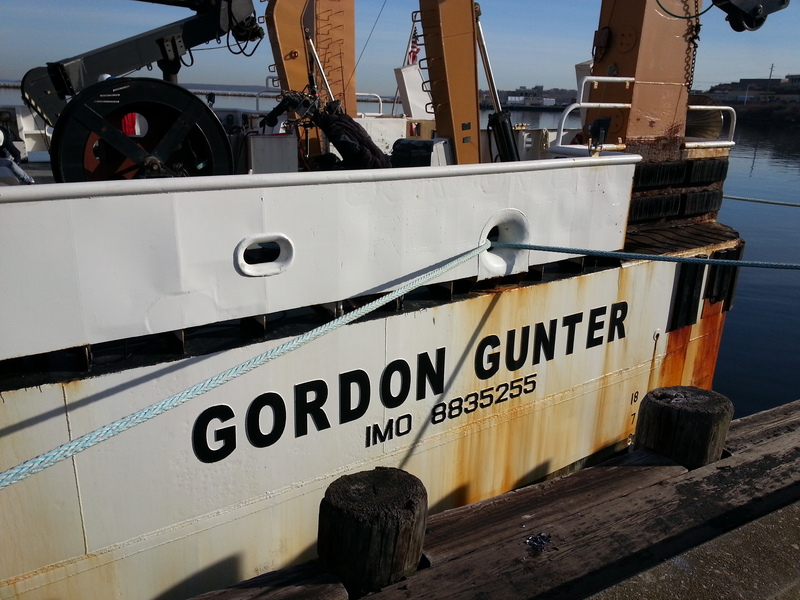 Boarding the NOAA Ship Gordon Gunter. Boarding the NOAA Ship Gordon Gunter in Newport, R.I.
And that’s just what we awoke to this morning – heavily clouded skies and fog. Unfortunately, it hasn’t moved on yet, and actually looks like it’s here to stay. This made visibility very poor. The fog horn had been blasting every few minutes all night so the fog didn’t come as a surprise, but was a disappointment. My first shift on watch was moved to the wheel house and we watched with the “naked eye” instead of the “big eye” (giant binoculars that are outside on the bridge). 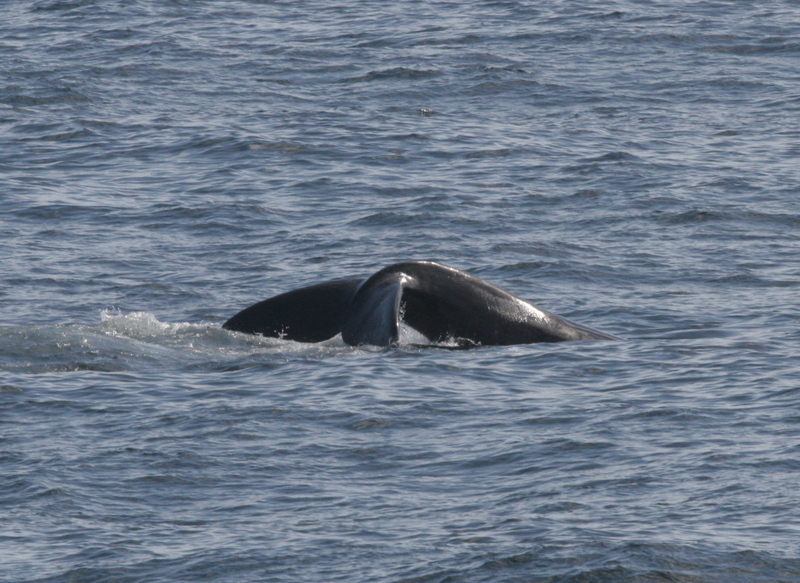 Our primary mission is to search for right whales, but any sea life observed is recorded. 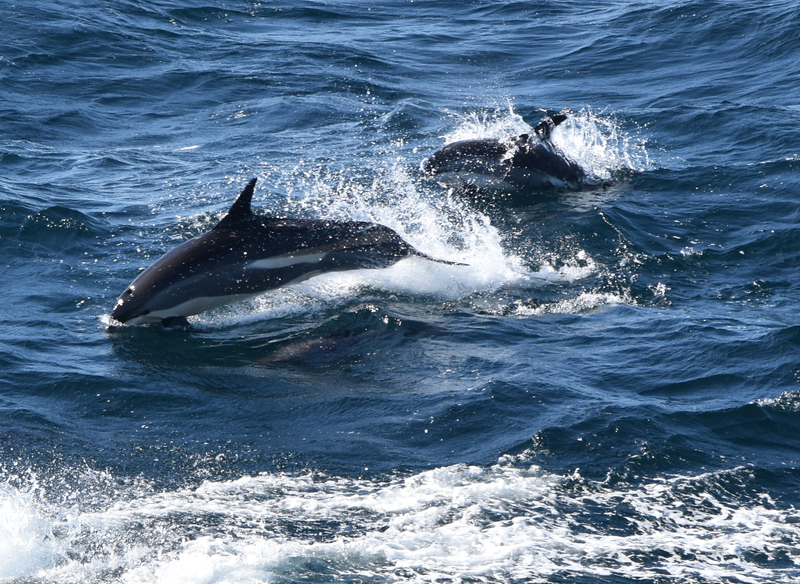 I was lucky enough to see 6 white sided dolphins on my first watch after Allison Henry (chief scientist) pointed them out to me. By mid-morning, the fog had lifted and the visibility improved. I am on 90 minute shifts from 7am-7pm with 90 minute breaks between shifts. 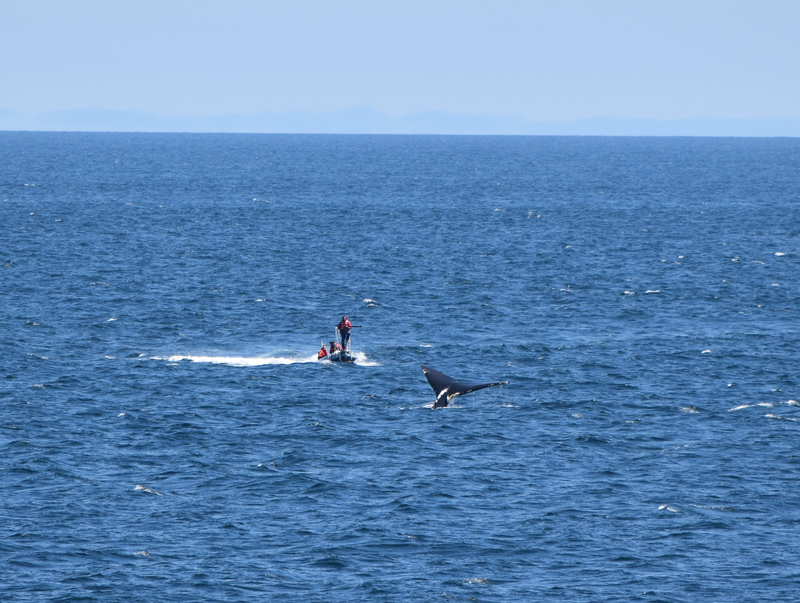 While working we either watch for whales or record data as others watch for whales. The scientists want to identify each whale they see. They do this by examining the unique patches of callosities the whales have on their heads and backs. The whales’ callosities are categorized as either broken or continuous. They have cataloged 669 right whales using this method since they began the identification process in the late 70’s. The callosities are the same color as the whale’s skin, but appear white or yellow due to the presence of thousands of tiny crustaceans called cyamids, or “whale lice”. If we spot a right whales and the conditions are good (no fog and the seas are not too choppy) some of us will go in the “small boats” to photograph the whales, and to do a biopsy sample on the whale if it has not already been sampled. Another small boat will try to tag the whale. Tagging the whale is a sophisticated process and uses high tech equipment. Mark Baumgartner from Woods Hole Oceanic Institute (WHOI) showed us the dermal tag he will be using on whales. He also showed us how the tagging equipment has evolved over the last few years. The tag is shot into the whale where it goes into the skin about 3 inches. It has a GPS attached to it so it can be recovered from the whale when it falls off (usually in 24 hours). The scientists can set it to come off the whale in a certain amount of time. The implantable dart stays in the whale’s skin until it eventually works its way out which they estimate to be in 3-4 weeks. This process startles the whale, but is not thought to cause them pain. We have been out on the water for 24 hours at this point, and I feel like I am adjusting well to life at sea. No seasickness yet (knock on wood), and I slept very comfortably last night (I know that comes as no surprise to any of you who know the ease with which I sleep in any situation). Everyone on the ship has been very friendly and willing to share information with me. The food is excellent, with lots of vegetarian choices, great mixed greens salad, and even a pineapple upside down cake for dessert last night. Did you know that right whales are identified by the callosities on their heads and bodies? Did you know that the North Atlantic right whale is one of the most endangered whales? It is estimated that there are only about 470 right whales alive today. Question of the day: What is the smallest whale in the world?